Often when I am teaching a watercolor lesson, I look for a simple, but somewhat challenging, object for my students to paint. 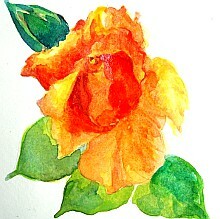 Here you will see how I paint a rose—an ever-popular subject--in watercolors. 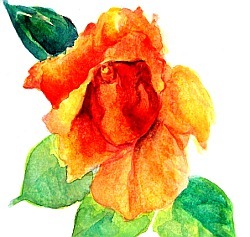 Once you know how to paint a rose well in this watercolor lesson, you'll be able to tackle most any flower in the garden with confidence. If you want to try painting the same subject in oil, click here. I use a well lit photo for reference by isolating the rose and a rose bud in the center. 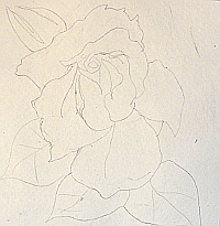 First, I create a more or less detailed pencil drawing with a graphite pencil on 140lb watercolor paper (unstretched). The more details in the complicated shapes, the better. This will help keep me from getting lost as I juggle between the drawing and the painting. I lay out washes of two different yellows in broad masses with a round brush. By mingling the two colors with a technique I discussed in another article, I manage to get two shades of yellow for a base wash and for the shadows. 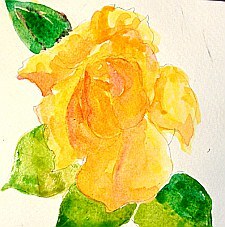 The rose has an overall yellow tone underneath, and the leaf green is also based in yellow. If the background is another color that does not include yellow (such as blue or purple), then yellow should not be applied first. Otherwise it will change whatever color is glazed over on top later. If the background color is blue, yellow will turn it to a green. If the background color is purple, yellow will dull it and make it turn brown. Understanding color theory and how to mix colors will definitely help! 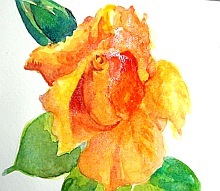 While the wash is still wet, I lay in another shade of yellow using yellow and orange for more value definition. Wet into wet creates softer looks, but I have to get the timing right. I start to mingle greens on the leaves wet into dry. I use a mixture of yellow, green, and blue for various patches of colors. 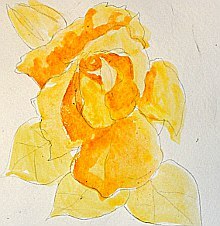 More subtle values are added on the rose as the painting progresses. 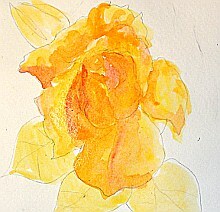 I start to add red into the yellow rose for darker values. Because yellow is such a light value color, I often find the layers I apply look washed out or not dark enough. Yellows, except for Indian Yellow, tend to be opaque. Often, when diluted with enough water, yellows can gain the transparency of other, inherently transparent colors. A blueish toned red is applied next to bring the form forward. I apply it wet into semi dry. I use a small round brush to delineate the dark accents in the rose with alizarin crimson. It is a transparent red so I can use a lot of pigments without diluting it too much. Additional details like the veins on the leaves and on the bulb are also added now. I hope you have learned something from the watercolor lesson here. It takes practice and patience to get to achieve what I want. If you are not confident about doing flowers (since they do come in so many shapes, sizes and colors), practice drawing them first. When you feel good about your drawings, then you can start working on doing them in watercolor. With the right drawing tools available and a constructive approach to drawing, you master the drawing part of this process. 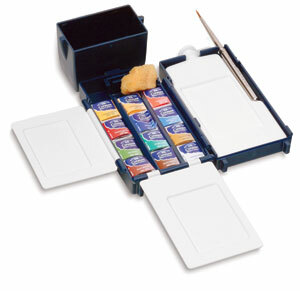 Then, with a good drawing as foundation, you can have more control over your watercolors. This doesn't mean you have to paint in an ultra-realist fashion. You can paint in watercolors either tightly or loosely. Once you have the tools, it is up to you how you use them.